Had it not been for nurse Jasmin Flores, little Noah might not be alive today. 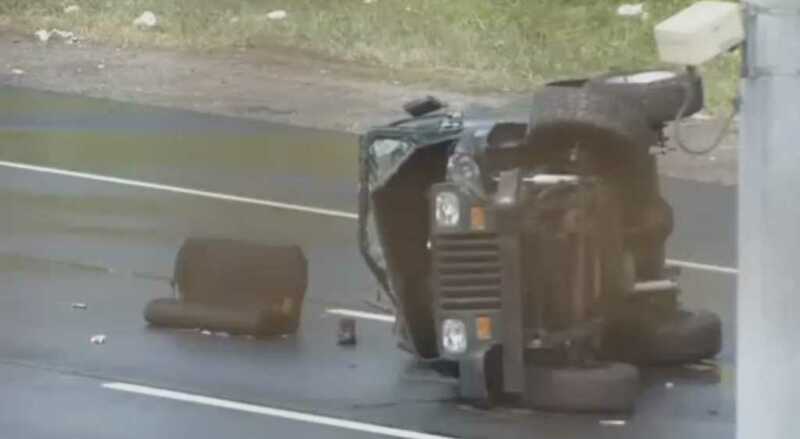 The 2-year-old toddler is now fighting for his life at the Connecticut Children’s Medical Center after being thrown from a Jeep and rolling down Interstate 91 south heading toward Rocky Hill in Connecticut, the Hartford Courant reported. Noah was in his car seat when he was ejected from the SUV earlier this week. The vehicle’s other two passengers were Noah’s father, 31-year-old Joshua Gootkin, who survived, and 60-year-old driver Benjamin Bidwell, who was pronounced dead at Hartford Hospital. Flores, a 39-year-old psychiatric nurse from Ellington, was traveling with her daughters, Leani, 9, and Tatiana, 10, to pick up her nieces in Madison for a swim meet when she noticed the overturned Jeep. At first, the nurse saw a man lying on the ground in pretty bad shape but was soon distracted by a car seat with a toddler still strapped inside rolling across the highway. She saw a man, whom she later discovered to be Gootkin, rushing after it. Once the car seat stopped, Flores recalled, Gootkin pulled little Noah out and cradled him as he cried, begging his young son to wake up. The father was “distraught” and “screaming,” Flores said before stepping in. Flores then pulled the baby from Gootkin’s arms and started performing CPR on him. Other passersby stopped, but didn’t know CPR and couldn’t provide much medical assistance. Some did what they could to comfort Gootkin while others prayed for the situation. At that point, she was still trying to resuscitate Bidwell, too. “I said, ‘Please help him, press on his chest. You are not going to do it wrong,’” Flores remembered, noting an occupational therapist who knew CPR had arrived at the scene. She was able to restore a pulse, but it was faint. While Flores, with the help of one other good Samaritan who held Noah’s head, was performing CPR on the little boy, Gootkin was wailing, “Noah, please don’t die!” At some point, while Flores was trying to revive Noah, medics finally arrived. The nurse described the entire ordeal as “heart-wrenching.” She said it took six sets of heart compressions before Noah’s pulse returned and he started breathing. “I couldn’t give up,” she said. Please continue to pray for Noah’s recovery.